When you watch your child grow, you start to realize the world in general is amazing to them. This happens with sensory development skills, many of which kids continuously explore when at daycare, or even at home in their play space. Seeing, feeling, hearing, smelling and all the other senses (of which there are more than six), help a child learn all about the world they live in. It’s like a constant science experiment to them. What happens when I squish this? What if I do it again? How about if I apply force and toss this toy across the room? Where does it go? Why? How? Let’s try that again! As you’re with a baby or toddler, it can get you to appreciate all the little things in life. And that’s a wonderful feeling. How neat it is that cylinders roll when they’re horizontally laid down! And what an interesting noise plastic bags make when you shake them! You know what’s also amazing? When you pull a tissue out of a tissue box, another one pops up, right before your eyes! Where did it come from? Ok, you may be giggling, but these are the types of things that babies and toddlers are discovering. It’s why YouTube videos of babies laughing hysterically at ripping paper go viral. To you, they’re the ‘everyday’ – the ultra common and expected. It’s not new to you, so you don’t notice them. You’ve moved on to bigger complexities like challenging yourself to learn how to drive, or type on a computer, or process the expanse of the universe. But when you’re engaging in child care, as we do daily at our daycare centres, it’s important to know what is ‘basic’ to a toddler, and what is not. 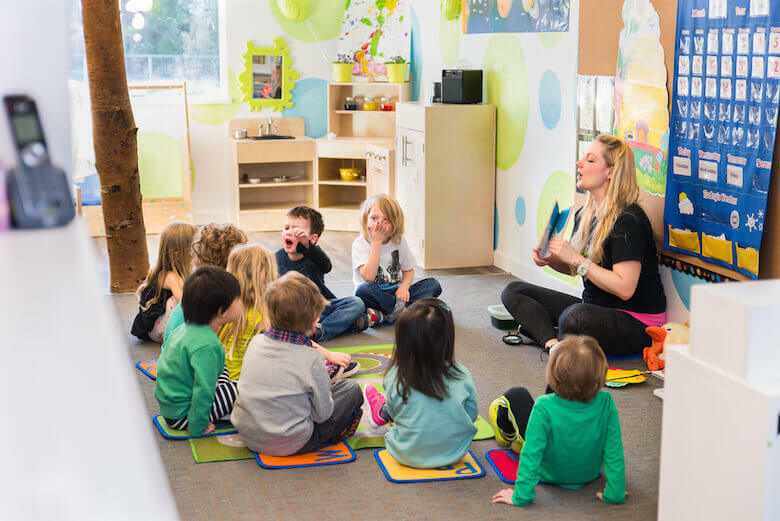 In order to be able to provide educational daycare opportunities, we must be thinking of the foundational knowledge they need to be able to advance to more complex tasks. Before we can teach addition and subtraction, we need them to understand what ‘more’ and ‘less’ is. Or what ‘big’ and ‘small’ are. We need them to understand how things can ‘go away’ but still be in existence. For example, if you eat the cracker, it’s gone! Where did it go? If you take another cracker, you have more! Did you eat a small cracker or a big one? This is an idea brought about on this blog post by Carly Seifert. She cites Alice Sterling Honig, Ph.D. for mentioning that “toddlers who are able to handle three-dimensional objects with coordination are able to begin deciphering two-dimensional images.” In a daycare, you’d want to have objects like a ball, for example, so that a child can relate this to a circle drawing that may represent a ball in a book. What is the character feeling? Why would the ball bounce? Or why throw it? But it does more than that. Promoting sensory development skills at daycare helps babies and toddlers understand the intangible world, or the ‘representative’ world. In short, these skills can help them with developing child imagination. It can also help them with language development. While it’s not a scientific source, this author gives sensible demonstrations for how sensory development skills enhance a child’s ability to learn new words to describe things. If you have felt ‘wet’ or heard ‘loud,’ you’ll want to say it one day. Certainly the experience of that sensation becomes easier to verbalize or explain. Imagine if the only communication skill children ever had for letting us know they don’t like something was to cry! Sensory development skills could thus be thought of as contributing to bringing them out of the ‘crying-to-communicate’ phase, to the talking phase. This goes hand-in-hand with our adult experiences of memory associations through sensory skills. We love pumpkin spice lattes because it gives us the nostalgic ‘smell’ and ‘taste’ of fall, right? Or what about associating summer with the smell of that SPF lotion you put on at the beach? Believe it or not, this is the process of learning – even in older kids and adults. Knowing one thing leads to knowing other things. And, when kids learn to communicate, that goes hand in hand when learning to read! This brings us back to the importance of experiencing the 3D world for the 2D understanding, and visa versa. Daycares should have sensory development stations. Here is an example of how they could look, or ideas of what they could contain. This should be an area where getting messy is totally ok. Usually the early childhood educators at daycare will have thought of providing things like coloured, uncooked pasta, a sandbox (or rice box), a water bin, play dough, music and sound instruments, and so on. They may also have created shoots and tubes or slides to roll objects on. As this extensive document explains, being willing to get messy is important for sensory development skills. This can be a great activity to allow the kids to get as messy as they want while at daycare, so you don’t have to deal with it at home! Of course, we’re not saying children shouldn’t continue developing sensory skills at home or in daily routines. They have plenty of finger food playing and toothpaste-to-mirror experimentation to do that with! If you are a working parent seeking child care options, one thing you may want to consider is the amount of sensory development tools your child care provider will offer your child. Don’t be afraid to ask for this! It’s not expensive, nor hard to do. It just takes some willingness on the part of the child care provider. You can also start small. If wet sand is too much for a child care centre to provide, it’s ok (we get it!). Why not start with items that are easy to vacuum, like food-coloured rice? Or, a supervised baking activity with the kids? Sensory skills opportunities are all around us!